What! Nothing happened? That’s because you forgot to click the link. Just make sure you’re sitting down before you click, and for goodness sake don’t be mid-coffee. Evidently beam-snarfing is a thing now, and most uncomfortable. Above: All of the images in this blog are merely screen caps from the 3D Showroom Tour. If you haven’t clicked the link, you’re not experiencing the 3D Showroom Tour. 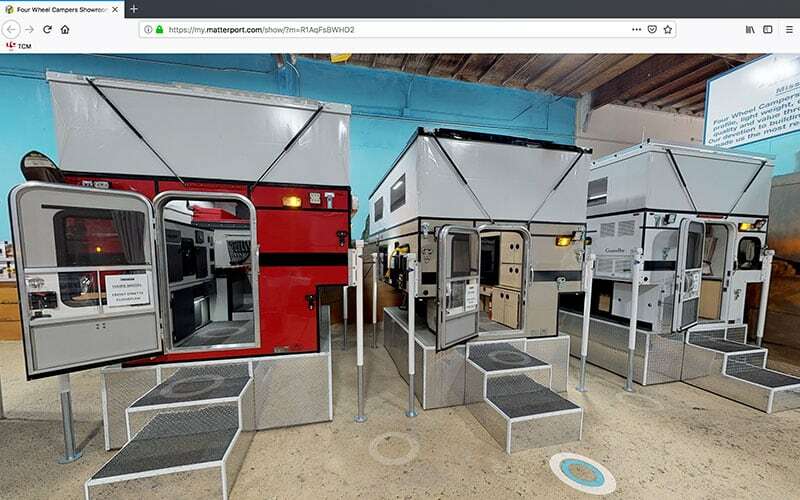 We have been fortunate to visit Four Wheel Campers several times over the years and it’s amazing how life-like this 3D virtual experience is. 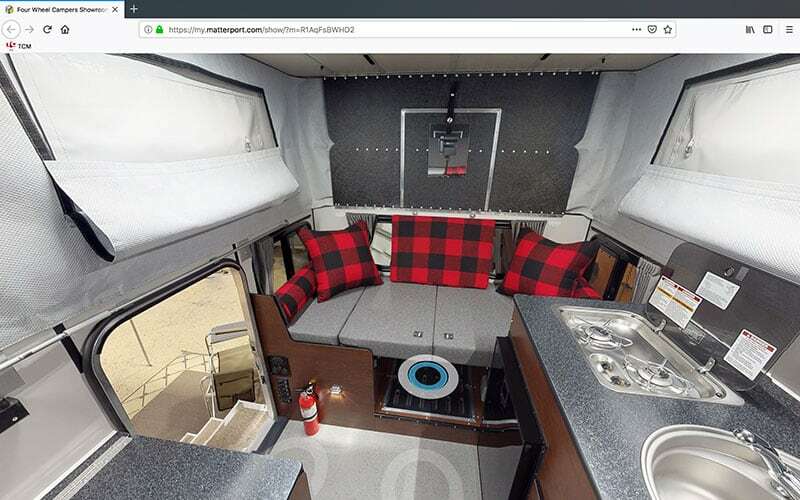 You can’t touch or sit in the Four Wheel Campers, but the visual experience gives you good idea of what a Four Wheel Camper is like in person. 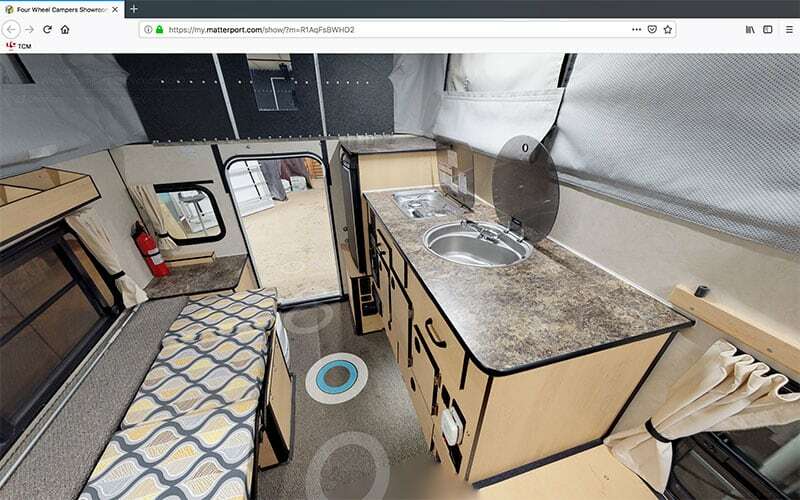 Four Wheel Camper’s virtual tour was done with a Matterport system. The 4K HDR cameras on the Matterport system are controlled via an iPad interface. Basically you put the Matterport camera in a location, press go, and get out of the way (literally). 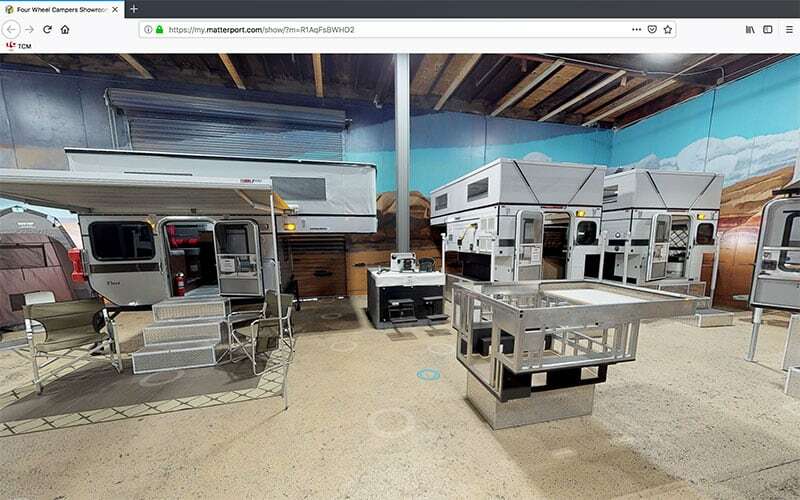 Once the Matterport camera has rotated to take the photos it needs, the images are stitched together in Matterport’s software. To make a moving tour, you put the camera in different locations. Then the Matterport software stitches together the different locations to create the tour you can “walk through”. It’s exciting to see this technology used for virtual product tours, especially for products that are not always on display where a consumer lives. If you like what you see in the tour, the next step is to check one out in person. You know, that experience when you’re not looking at a black rectangle? It still exists! For more information about Four Wheel Campers, visit their website at fourwh.com. Click here to get a free Four Wheel Camper brochure. Reader Poll: Professionally Matched Truck and Camper Rigs?